Majid-ul-Haq was born in Magura in 1926, hut grew up in Delhi where his father was working in the Indian Central Government After completing his schooling from Raisina Bengali High School, he went on o do his Intermediate from Hindu College. He then enrolled in English Honours at the same college. However, the death of his father obliged him to rethink his career and he switched to engineering at the Bengal College of Engineering, Shibpur. In 1946 he joined the British Indian Army and underwent training at the Indian Military Academy. 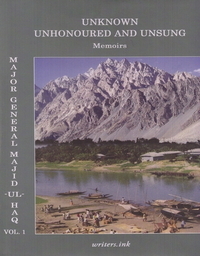 In 1947, he was transferred to Pakistan and commissioned as a Regular Officer in the Pakistan Army, subsequently joining the Corps of Engineers.He had various field and staff postings in both East and West Pakistan: Sialkot, Mardan, Risalpur, Kahsmir, Rawalpindi, Dhaka, Quetta, Karachi and the Karakoram Heights. He was also briefly deputed to the Planning Department at Dhaka. He attended the Command and General Staff College at Fort Leavenworth, US, but was recalled when the 1965 War broke out between India and Pakistan. He was then posted to Karachi to the Pakistan Navy and thereafter to Gilgit to work on the Karakoram Mountain Highway Project. After the declaration of martial law in 1969, he was posted as Deputy Martial Law Administrator in East Pakistan. A disagreement with one of his erstwhile West Pakistani colleagues led to his being sent back to General Headquarters in Rawalpindi before the 1970 elections.In September 1971 he and his family were moved to detention camps, first in Kohat then in Mandi Bahauddin. Repatriated to independent Bangladesh in 1973, he served in various capacities: Chairman Bangladesh Steel Corporation special Secretary with the rank and status of State Minister, Minister for Industries, establishment, Water Resources, Port and Shipping. Jute and Textiles, and Agriculture under various governments. He played an active role in the movement for the restoration of democracy against President Ershad. In June 1996 he resigned from the Standing Committee of the Bangladesh Nationalist Party, and in 2001 from the party. He now leads a retired life and is writing the second volume of his memoirs.